Who is that taking an early lead in her career over such established country artists like The Dixie Chicks, Faith Hill and Carrie Underwood? 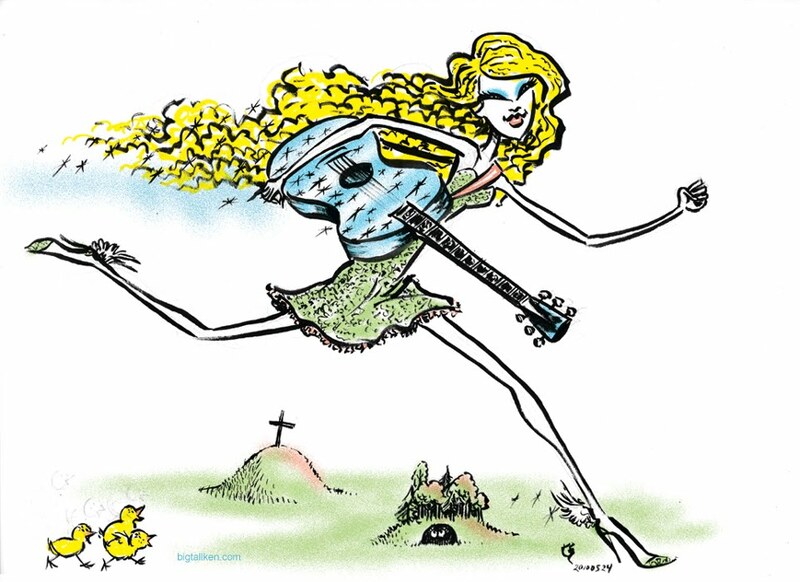 Why it's Taylor Swift of course! It doesn't hurt that her 5'11" height and long legs gives her some advantage (in more ways than one). I can't say much about her music since I'm not into the pop country style, but I'm sure my niece can fill me in on how good it is. She was charming and funny on Saturday Night Live and in the movie, "Valentine's Day." Time will tell if she has the endurance to maintain her star power. I checked out a book called "Live & Learn: Expressive Drawing: A Practical Guide to Freeing the Artist Within" by Steven Aimone from the library. Seeing some of the freestyle charcoal and brush strokes made me want to cut loose a little with my inking. I had some of that feeling inking Paganini. Once I got past the tricky violin in was fun using broad strokes to fill in his hair and clothing. In this case I drew a very light, loose pencil sketch, which I purposely left showing in the final. You can just make out a few lines. I used a natural hair Utrecht #4 brush. The brush tip is a bit longer than the Nylon brushes I normally use with a few hairs making a very flexible tip. It's a little more difficult to control and dries out a little faster, but I wanted that looser look and was able to achieve some dry brush textures more easily. It reminds me just how far computers have to go before they can replicate such inking work. I tried not to overdo the color in Photoshop, which is where I still struggle the most. P.S. Look for upcoming posts on Neko Case and Janelle Monae, two unique singers of the music world. It's a busy week at work, so I resurrected a sketch from 2002 and patched in some color in Photoshop. 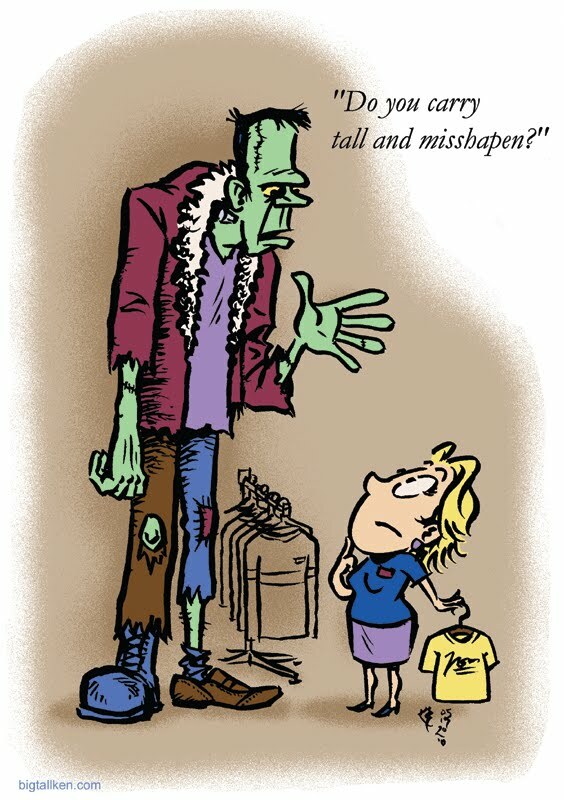 A little low brow tall humor for you. 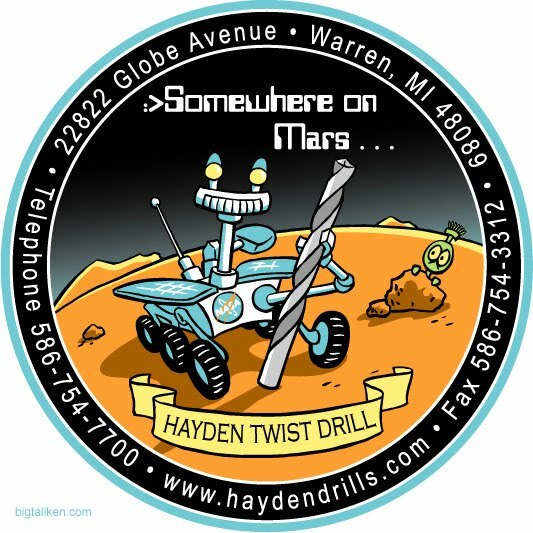 When you're a few million miles away on Mars you want to have the right equipment, in this case, a Hayden drill bit. I created this illustration a few years ago for a local drill bit company. When they ship their drills they would include stickers in the packaging. They hired me to create one with a light touch to promote the fact that one of their products was used on a Mars rover, which I thought was pretty cool. The requirements were to keep the colors under four plus black and the white of the paper for the sticker and try to include Marvin Martian from Bugs Bunny cartoons. I did not feel comfortable ripping off Warner Brothers, so I made my Martian an homage instead. It was a challenge to anthropomorphize the Mars rover. In the end they were happy with it. This is my ode to Lux Interior (1946-2009), lead singer for The Cramps. I have enjoyed listening to The Cramps ever since I heard their version of "Green Door" back in high school on Akron's WAPS. While listening to their song, "Mad Daddy" the other day the lyric, "Six foot three with my feet on the floor, Hey, baby, whatcha waitin' for!?" I realized he must be referring to himself! I verified it by reading the back cover of "The Cramps: A Short History of Rock 'n' Roll Psychosis" on Amazon, which said he was 6'4". May Lux's wife and lead guitarist, Poison Ivy Rorschach, continue to find happiness after 37 years of marriage. It is absolutely amazing that this couple met with a shared vision of music and performed together night in and night out for over 3o years, giving the audience 200% every time they did. I had the opportunity to see them in concert at St. Andrew's Hall for their Flamejob tour, and it was a blast! If everyone could put as much passion and love into what they do as they did, the world would be a better place. Rock on. I went through several sketches of Lux in various poses trying to capture his energy and stage presence after watching several videos on YouTube. I thought I would ink a few, compile them in Photoshop and be done with it, but then I sketched her face and mass of curls. How could I leave out Poison Ivy? The Cramps would not exist if either either was missing. On stage she hardly moves while he is everywhere, limbs flailing, torso twisting, writhing and sweating in pure animal frenzy. I doodled another few thumbnails trying to figure out a composition. 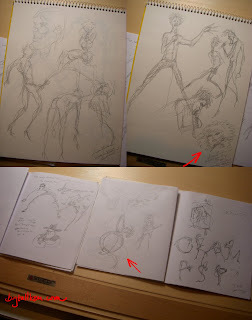 Then I looked at a sketch where I had him bent into a "S" shape and then at the band name; BAM! The final was drawn and inked on Strathmore 100lb Bristol vellum using a #3 Nylon brush. The coloring was done in Photoshop using gradients in dissolve mode. 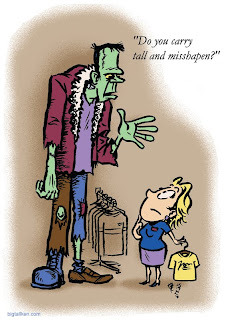 Occasionally this question comes ups among friends when discussing clothes, "Where do you carry your height?" 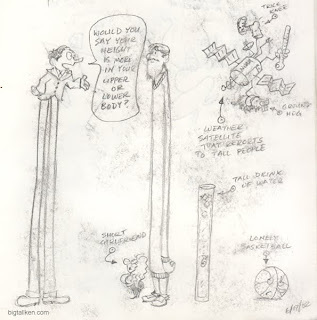 What I learned from "The Tall Book" is that taller people usually have longer shins. Long legs are a sign of good health. In poorer countries where nutrition is not as good people generally have shorter legs and longer torsos. Looking back on my business trips to Mexico I would say this is generally true. Here is a brief Korean study on height relative to leg length and arm span. The book's author, Arianne Cohen, writes that her shins are quite a bit longer than average. She should feel proud as this study found that a high leg length to height ratio is found to be more attractive. 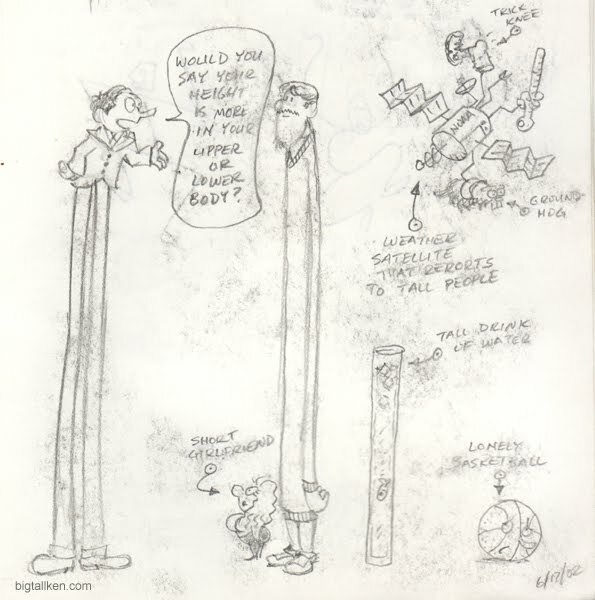 I had made this sketch in 2002 where I must of been thinking of trying to do tall gag humor, which went nowhere. I'm better at making humorous art than writing humor. I stuck with the same concept and redrew it on a cheap sketch pad and added watercolor. I won't do that again as the paper warped and the watercolor soaked in erratically. But it was good practice. I think it's missing a little texture.